Our Bridgend Adoption Centre in South Wales is caring for a mother cat and kittens that were found at a nearby prison. A prison worker had arrived at HMP Parc to find the cat and her six-strong brood nestled in a truck in the yard. The kittens were taken back to the centre and bottle-fed every two hours while they waited to be reunited with their mother. Luckily, the mother cat – dubbed Agatha by centre staff – was safely detained 24 hours later and reunited with her brood. Staff at the centre were apprehensive as there was a risk that the mum would reject her kittens. A smearing of cat food applied to the kittens’ fur to disguise human smells worked effectively and Agatha was soon contentedly nursing her kittens. Sue Dobbs, Centre Manager, says: "We were glad to be able to help Parc Prison with their new arrivals, and it's great to see mum and kittens happily reunited. This story has a happy ending but sadly this isn't the case for many others. 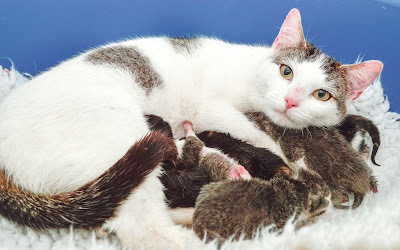 We have already had a bumper start to kitten season and would encourage everyone to get their cats neutered to prevent the problem of unwanted kittens." Centre staff named the kittens after famous crime writers and characters – Christie, Jessica, Marple, Morse, Kojak and Sherlock. They will be cared for in the centre until they are ready for rehoming in eight to nine weeks’ time. Mum Agatha will also be available for rehoming once the kittens are weaned and she is neutered. Cats Protection’s Bridgend Adoption Centre in south Wales currently has over 180 cats and kittens in its care. If you would like to adopt a cat, please contact the centre on 01656 724 396 or email bridgend@cats.org.uk. Love the names! Good luck kitties! Wouldn't it be great if more people got their cats neutered?